Are Elk Grove Water District ratepayer increases being used to fuel expansion, engage in empire building? At the Wednesday, August 1 meeting of the Sacramento Local Agency Formation Commission (LAFCO) there was a presentation on the City of Elk Grove Sphere of Influence application for its proposed sports park complex. That 99-acre-parcel of land that the proposed complex sits on, which former Mayor Gary Davis touted as a possible site for a Major League Soccer team, is part of 579-acres Elk Grove is seeking to annex. Although the presentation was a so-called receive and file report for the LAFCO commissioners, which includes Elk Grove Council Member Pat Hume, there is information of concern contained in the 2015 notice of preparation. That information of concern would involved ratepayers in the Elk Grove Water District. The EGWD, which is ostensibly part of the Florin Resources Conservation District, included a letter (posted below) from the water provider's general manager, Mark Madison. In his letter to LAFCO, Madison expressed the district's desire to provide water to the sports complex. Madison said in his letter that retail water distribution is currently assigned to Sacramento County Water Agency (SCWA) Zone 41, he believes EGWD "could provide the same service by purchasing wholesale water from SCWA Zone 40." 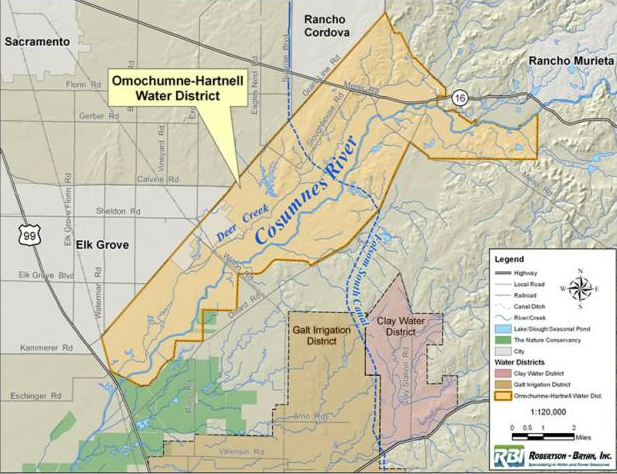 Presently, that area is under the jurisdiction of the Omochumne-Hartnell Water District. The primary mission of the OHWD has been "for the benefit of District agricultural users adjacent to the Cosumnes River and Deer Creek." While Madison's letter was written almost three years ago, it is noteworthy in that the district wants to expand under its current financial situation. This expressed desire is being done while EGWD ratepayers, which are paying among the highest retail water rates in the region, have been subjected to a recently approved price hike that will be effective January 1, 2019. Should EGWB be able to jump the hoops, annex that portion of OHWD and wrest control of retail water distribution from SCWA Zone 41, the next question becomes, who will be paying for the expansion? Will the recent rate increases approved by the five-member board be used toward this end, or will those five directors and Madison go to the well again, so to speak, and seek yet another rate hike? Ratepayers should note one of the positions Madison held before taking over management of the EGWB, was in the City in Stockton. While there, Madison was deeply involved in the disastrous privatization of that municipal water operation. As the City of Elk Grove pursues its annexation for it soccer fields, EGWD ratepayers would be well advised to monitor the activities of Madison and his board of directors. Their empire building and thirst for expansion could well be coming from the billfolds of ratepayers.